THE LEGEND. THE VETERAN. THE APEX. 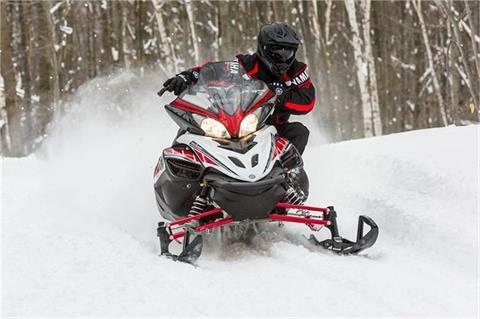 From broad, linear torque, to the electric power steering, what you get from Apex is the most reliable, yet high performing snowmobile to ever touch snow. 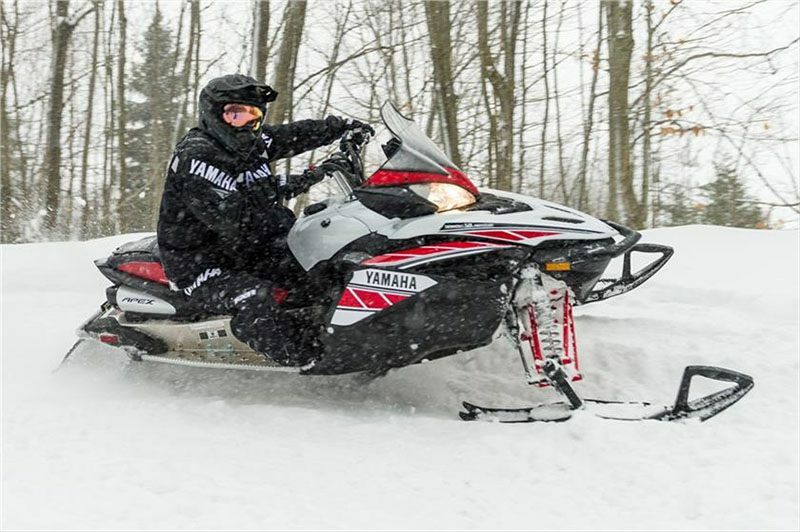 INTEGRATED REAR SEAT STORAGE: Like all Yamaha snowmobiles, attention to detail is found everywhere including our integrated seat storage trunk. A secure and easy to use turn clasp unlocks spacious in-seat storage large enough to hold water, goggles, gloves or other riding essentials. WIDE, HOOKED END HANDLEBARS: Yamaha bars are flat and wide, engineered for comfort, control, and natural ergonomics. Integrated hooked ends add additional control options while cornering, and feature heated grips across that span the entire length. 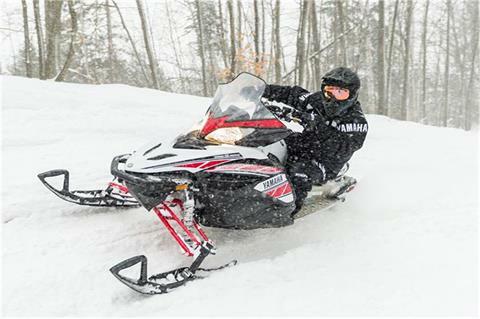 RIPSAW II TRACK: Regarded as the best high-performance terrain track available, the 129 x 1.25inch lug design of the RipSaw II delivers incredible acceleration, braking control, and handling in a wide variety of conditions. YAMAHA PERFORMANCE DAMPERS: Exclusive Yamaha technology, the Performance Damper is designed for exceptional overall chassis performance by harnessing unwanted chassis vibration and distortion. 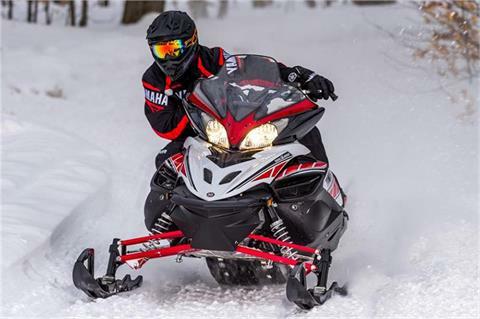 The Performance Damper captures unwanted chassis energy resulting in exceptional control and comfort with remarkable high-speed stability and tracking through rutted and chatter bump filled corners. 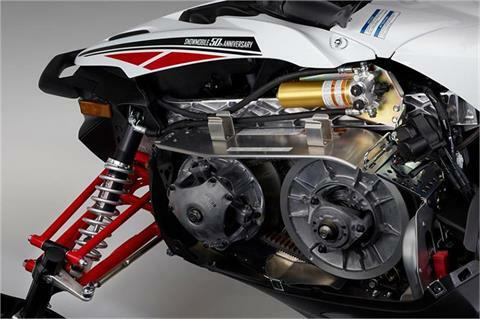 NISSIN HYDRAULIC BRAKE: This Nissin 4-piston hydraulic brake system uses a large vented rotor and caliper to effortlessly pull the machine down from speed. One finger modulation is easy with the ergonomically shaped aluminum brake lever. A secondary caliper and lever are employed for a separate 'parking brake' to hold the track when not in use. CF DIE-CAST BULKHEAD: Control Filled Die Casting is an exclusive Yamaha technology that allows engineers to regulate the thicknesses required for maximum structural performance with a minimum of weight and material. This can be carried out in mass production to create multiple components with identical tolerances, another key to Yamaha quality and reliability. GENESIS 998CC 4-CYLINDER ENGINE: The high RPM Genesis 998 cc 4-stroke is one of the most sophisticated engines to ever power a snowmobile. 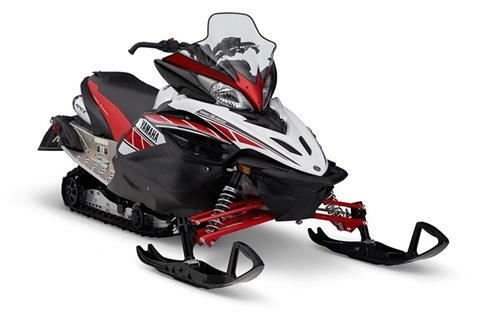 The quick revving four-cylinder engine is incredibly smooth and linear in its power delivery. Year after year, the 998 cc delivers the perfect combination of power, fuel efficiency, and durability while producing the sweetest sound in snowmobiling. 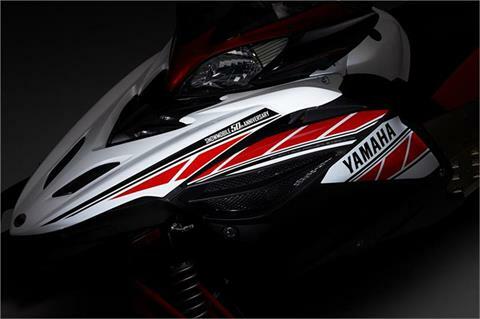 EXUP EXHAUST VALVE SYSTEM: The Yamaha exclusive EXUP valve technology controls exhaust pressure waves for optimum intake and exhaust efficiency. 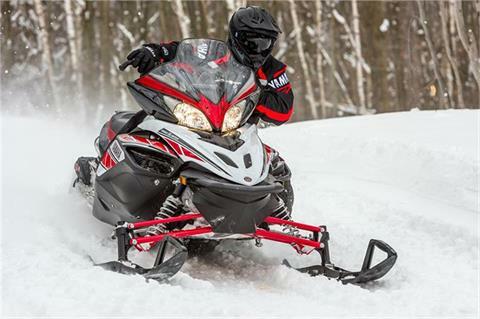 The result is increased midrange torque and crisp throttle response while retaining exhilarating top-end power. 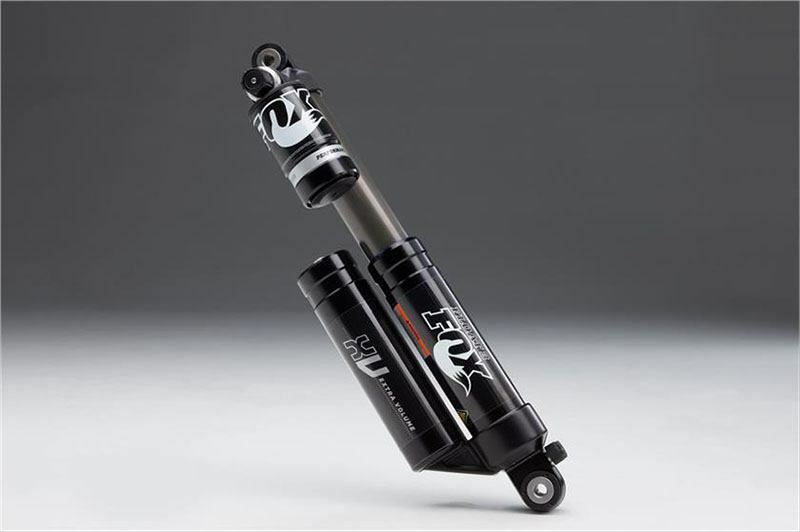 SINGLESHOT 129 REAR SUSPENSION: The SingleShot rear suspension features a revised drop-link rear suspension linkage, new geometry, and a significant weight loss over previous designs. 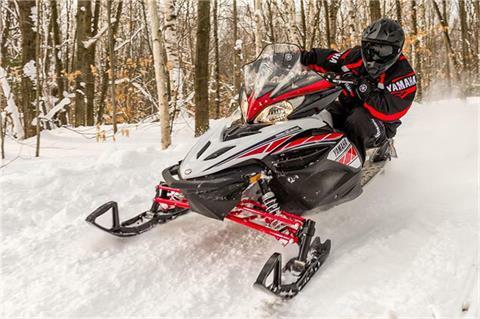 The dual arm, fully-coupled suspension features inside the rail coupling blocks, an improved track tensioning system, and a reduction of more than 10-pounds than the previous 128-inch Mono Shock suspension…all while delivering exceptional ride quality and control in rough terrain. 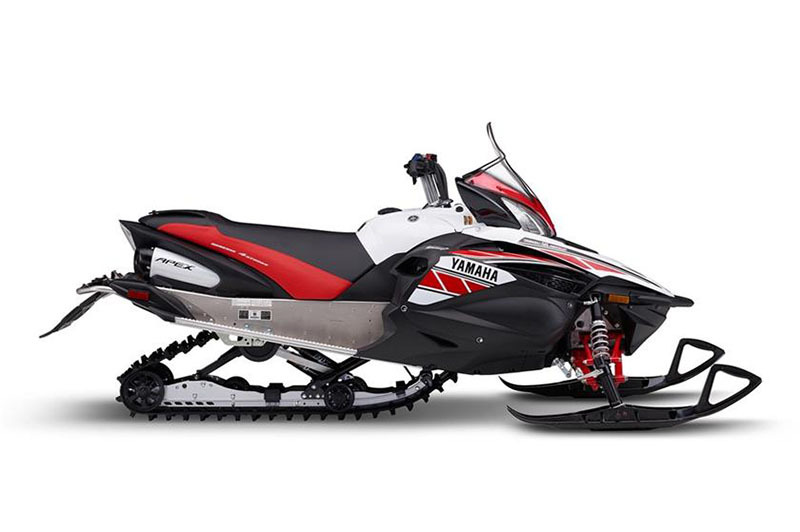 YRSS YAMAHA REACTIVE SUSPENSION SYSTEM: This exclusive Yamaha technology connects the two front shock absorber bodies hydraulically. 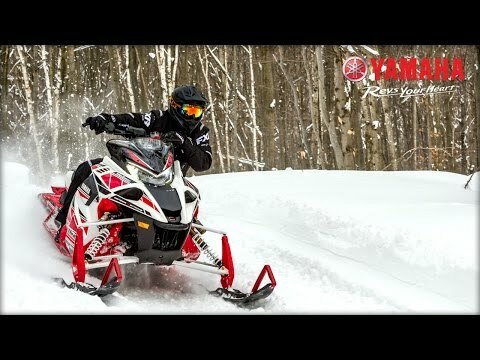 Oil flows between the shocks through a YRSS control unit that affects damping and volume transfer based on the movement and forces generated at each ski. This system helps control lateral roll without compromise to bump compliance and comfort. 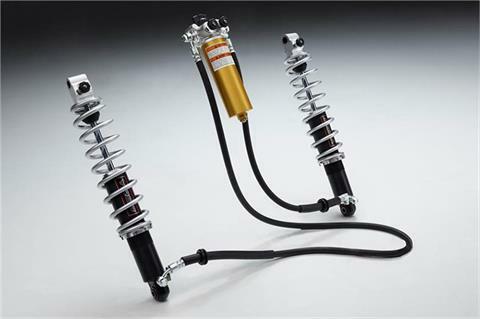 The net result is an overall improvement in ride quality with more precise handling over conventional shock absorbers which must compromise ride comfort for roll stability using independent damping calibration and stiff springs. 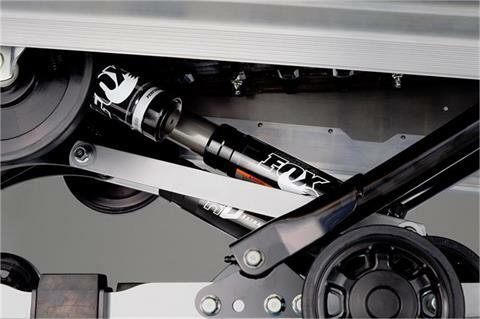 FOX® FLOAT® 3 XV REAR SHOCK: The FOX® FLOAT® 3 XV shock provides air-spring technology with a secondary Extra Volume chamber designed specifically to eliminate unwanted harsh bottoming. The added volume of the twin chamber design delivers exceptional ride and handling over rough terrain. Both the primary and secondary XV air-spring chambers are infinitely adjustable for both rider preference and conditions.